The late Terry Drury, a former Ford Motor Company engineer. was a very familiar figure in British national and International racing, well remembered for his exploits as an energetic Ford GT40 privateer in the late 1960s. This 1968 GT40 was assembled by Terry Drury Racing, which is based upon an original Abbey Panels-made monocoque chassis from period, supplied to Terry Drury by Ford after his car, chassis '1073’, had been damaged in an accident during the Monza 1,000Kms race in April 1968. This is an ultra rare build especially consisting of not only this extraordinarily faithfully-constructed monocoque but so many original period correct parts from Terry Drury's personal collection. This is a most accurate-monocoque Ford GT40, so described by the acknowledged specialist investigator in this field, offering great potential as either a high-performance road car, or indeed as a FIA-regulation Historic racing car. Inside the car features the original steering column, steering rack and tie rods while the new Moto-Lita steering wheel has been made to the correct period measurements and detailed finish. The seats have been made by the original trimmer, featuring fibreglass backs, parachute material covering and brass eyelets. Front and rear magnesium suspension uprights, tubular steel wishbones, hubs, rear top wishbone tie bars, rear anti-roll bars and driveshafts are original stock. The original Koni double adjustable spring/damper units have also been refreshed by TrueChoice in the USA while the only new addition to the suspension is the front anti-roll bar. An original set of magnesium BRM front wheels feature, which Terry Drury kept from period while the rear BRM wheels are new to match. The engine is an original Works 302 cubic inch Gurney Weslake Ford V8, most notably complete with its original works steel crank, Indy rods and the works peak-top pistons. The bore sizes are still 4-inches. The rocker assembly was more recently acquired with other miscellaneous parts via Dan Gurney's private collection. Original Italian Weber carburettors are fitted. Terry Drury accumulated many body sections and this car as offered features original period-correct vented nose, rear body and doors with period-correct latches, indeed as used at Monza, Spa and Le Mans. 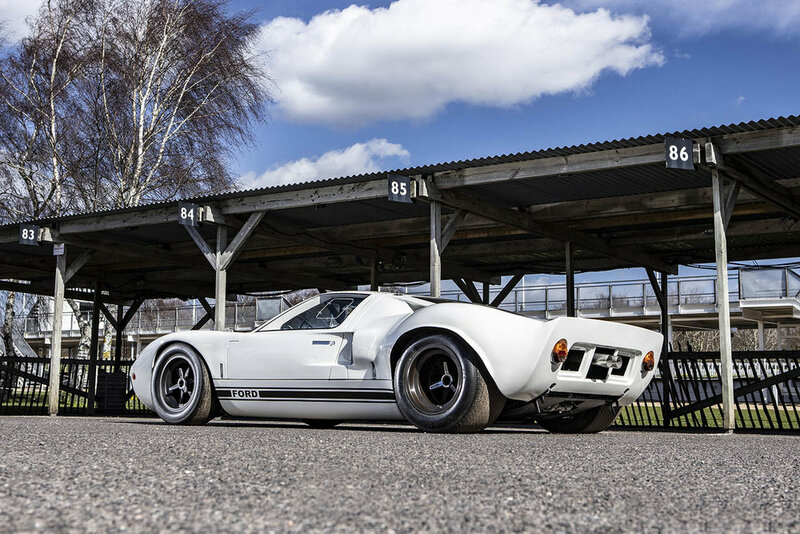 Bonhams will be offering this beautiful 1968 GT40 at their upcoming Goodwood Members’ Meeting auction on the 7th April. For more information on this and other vehicles at the sale, click on the link below. Photos courtesy of Bonhams.